David A. Keene is Editor at Large at The Washington Times, the nation’s largest conservative newspaper. His book Shall Not Be Infringed: The New Assaults on Your Second Amendment will be followed by a book on the modern conservative movement in America in 2018. While serving as President of the National Rifle Association (NRA), Keene, along with NRA’s Executive Vice President Wayne LaPierre, led the “All-In” Campaign to elect Second Amendment supporters to federal and state office in 2012 and worked tirelessly to keep the U.S. from adopting further gun control legislation in 2013. NRA membership grew from four to five plus million members during his two traditional one-year terms. Keene remains on the NRA board and chairs the Publications Policy Committee, the International Affairs Subcommittee, and the National School Shield program. 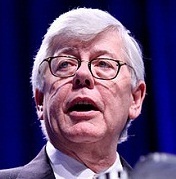 From 1982 to 2011, Keene served as the elected Chairman of the American Conservative Union (ACU), the nation’s oldest and largest grassroots conservative advocacy group. ACU is the major organizer of the annual Conservative Political Action Conference or CPAC, which Keene grew from 200 to 11,000 conservative activists. CPAC meets in Washington, DC, each winter to hear conservative leaders and to network with fellow conservatives from around the country and the world. Keene remains on the boards of The Center for the National Interest, The Constitution Project, The Montana Policy Institute, and has served as National Chairman of Young Americans for Freedom, among others. He has been a John F. Kennedy Fellow at Harvard University's Institute of Policy, a First Amendment Fellow at Vanderbilt University’s Freedom Forum, and a member of the Board of Visitors at Duke University’s Public Policy School. After earning his law degree from the University of Wisconsin in 1970, Keene served as a Special Assistant to Vice President Spiro Agnew during the Nixon Administration, Executive Assistant to New York Senator Jim Buckley, and as an advisor to the presidential campaigns of Ronald Reagan, George H.W. Bush, Bob Dole and Mitt Romney and many state and local campaigns. For more than ten years, Keene wrote a regular column for The Hill, which focuses on Capitol Hill. He has written extensively on politics, civil liberties and criminal justice issues for the Boston Globe, National Review, Human Events, and the American Spectator and others, and has contributed to numerous books and hundreds of radio and television programs, including as a consultant to CBS News His Lifetime Achievement Awards include those from CPAC, Young Americas Foundation, the Second Amendment Foundation and the Council of Racial Equality. Keene is married to Donna Wiesner Keene and they enjoy the company of five children, seven grandchildren, and a great-grandchild. They work in Washington, DC, and protect their sanity with extended trips to Montana and West Virginia to hunt, fish and enjoy the outdoors.